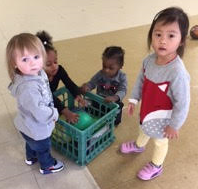 Our one year old program has been designed to encourage growth and development through play. Our experienced and nurturing staff at The Learning Center at Calvary helps your child engage in a playful environment. This is more than exploring their surroundings, this is creative learning through play. This colorful space is a shoe-less environment. Hospital shoe covers are provided for visitors and staff to slip on when entering the room. Our toddler center is also a shoe-less room with stimulating areas of play. This helps your child's communication skills as they navigate with their classmates. Our teachers help with hands-on projects to help them adjust to life in a classroom. 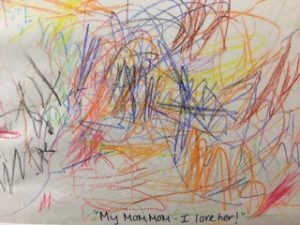 Whether through artistic expression or motor skill sharpening, your child will have endless enjoyable experiences as they quickly grow in front of your eyes! The teacher creates and follows a lesson plan in accordance with the Creative Curriculum. The goal of this program is to incorporate discovery, sensory play, dramatic play and self-help skills to stimulate and delight each child in the program. We provide breakfast, lunch and afternoon snack along with milk and 100 % juice daily. Diapers and wipes are provided by parents. The Learning Center at Calvary has served the Delaware communities of Wilmington and Claymont for over 10 years. Our administration and teaching staff has more than 3 decades of experience in early childhood education and child care. We pride ourselves on offering reliable and professional education for your children. We recently notched a 4-stars level in the Delaware STARS program, and we are close to achieving our fifth. Your child will benefit from focused education that explores all facets of their cognitive and exploration skills. Serving Parents To Help Children Grow! or click the button to get started! Business Hours: 6:30 a.m. - 5:30 p.m. Copyright 2019 The Learning Center at Calvary All Rights Reserved.